The Deep, Underground Maze is the sixth level of World 6 in the game Super Mario World 2: Yoshi's Island and Yoshi's Island: Super Mario Advance 3. This level takes place, as the name suggests, in the depths of an underground maze. Brown Yoshi will start out outside the cave, in an open area with starry skies. All Yoshi has to do to enter the cave is follow the path, and the entrance should be not too far from this area. Yoshi will find two Chomp Rocks in his way to the cave. He can jump on them and use them as stepping stones to reach a small hole in the wall, where he can find an invisible Winged Cloud. Yoshi must use one of these Chomp Rocks to reach a tall platform above the entrance, where he can find two Red Coins, and a Crate. To enter the underground maze, Yoshi must ground pound the orange blocks, and destroy them all the way down to the cave. Next, Yoshi will find a corridor with Tap-Taps, Lava Drops, and a Chomp Rock in the ceiling. He can simply destroy a small orange block, to make the Chomp Rock fall down. He can then use it to defeat the various enemies in his way, until he reaches another group of orange blocks in the floor. Yoshi must, again, push the Chomp Rock through the corridor, because he will have to use it to reach a Key in a platform. 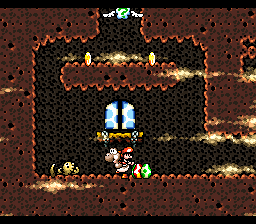 Yoshi can also find a Spooky and a spring ball here, which he can use to go back to the entrance of the cave. Now, Yoshi must find a locked door, and use the key to open it. This door will lead Yoshi to a misty maze area, where he will find Boo Guys, and a large quantity of orange blocks in the floor. He must ground pound all these blocks, revealing small paths along the underground walls. The very first one, in the left wall, will lead the dinosaur to a Tulip, and some red coins. After destroying the orange blocks, Yoshi will fall in the bottom of the maze, where a Flamer Guy will try to run into the dinosaur. He can find two doors in this area, one in the left, and another in the right. The left door will lead him to an area with Zeus Guys and Snifits. In order to collect a Flower, guarded by two Zeus Guys, Yoshi must hit it with an Egg. Yoshi must climb the platforms in the room, navigating through several rooms of the maze, with all of them marked with numbers in the walls, while dealing with Spookies and even Solo Toadies in his way. Yoshi will find a door at the room six, and it will lead him to an area with a Winged Cloud, which must be hit to cause a platform to appear directly below the orange blocks in the previous area. This will help him reach a locked door, which will lead him out of the maze. The key to open this door is located above the right door, in a Winged Cloud. Now, Yoshi will be outside the cave, where he will find the goal, along with a Chomp Rock to defeat a line of Tap-Taps. French Dédale Démoniaque. Diabolical Dungeon. This page was last edited on April 9, 2019, at 02:41.